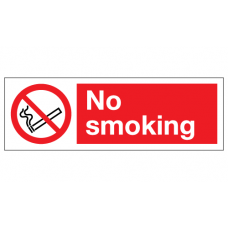 No Smoking Sign - Clearview Printed onto 6mm Cast Acrylic With Green Edge, Comes Complete With X2 Stainless Steel Standoffs. No smoking. It is against the law to smoke in these premises. Sign - Clearview Printed onto 6mm Cast Acrylic With Green Edge, Comes Complete With X2 Stainless Steel Standoffs.